Claude Chappe invented an optical telegraph network that operated in France from 1792 through 1846. It was instrumental in Napoleon's succees. It appears it may figure prominently in the Count of Monte Cristo's vengeance. "Yes, indeed, the very thing: a telegraph. Often, at the end of a road, on a hilltop, in the sunshine, I have seen those folding black arms extended lke the legs of some giant beetle, and I promise you, those bizarre signals so accurately travelling through the air, carrying the unknown wishes of a man sitting behind one table to another man sitting at the far end of the line behind another table, three hundred leagues away, were written against the greyness of the clouds or the blue of the sky by the sole will of that all-powerful master. Then I have thought of genies, sylphs, gnomes and other occult forces, and laughed. Never did I wish to go over and examine these great insects with their white bellies and slender black legs, because I was afraid that under their stone wings I would find the human genie, cramped, pedantic, stuffed with arcane science and sorcery. Then, one fine morning, I discovered that the motor that drives every telegraph is a poor devil of a clerk who earns twelve hundred francs a year and — instead of watching the sky like an astronomer, or the water like a fisherman, or the landscape like an idler — spends the whole day staring at the insect with the white belly and black legs that corresponds to his own and is sited some four or five leagues away. At this, I became curious to study this living chrysalis from close up and to watch the dumbshow that it offers from the bottom of its shell to that other chrysalis, by pulling bits of string one after the other." "So that is where you are going?" "To which telegraph? The one belonging to the Ministry of the Interior, or the observatory?" "No, certainly not. There I should find people who would try to force me to understand things of which I would prefer to remain ignorant, and insist on trying to explain a mystery that is beyond their grasp. Come! I want to keep my illusions about insects; it is enough to have lost those I had about human beings. So I shall not go either to the telegraph at the Ministry of the Interior, or to the one at the observatory. What I need is a telegraph in the open countryside, so I can see the fellow fixed in his tower and in his pure state." — from The Count of Monte Cristo, by Alexandre Dumas. A ghost in the machine. 1799: Napoleon seizes power. Sends the message "Paris is quiet and the good citizens are content." Moral Disorder, Margaret Atwood — I'm not much for short stories, and wouldn't've searched this book out, but given me as a gift, once day it struck me as perfect commute reading. And it was. On every page something poignant or clever, or downright sad or funny, or just plain true. Most of the stories are interconnected, weaving through characters' lives over decades, and I much preferred these stories to the ones that didn't have these characters in common (though it could be said they were loosely thematically related), which just goes to show that my preference for novels over short stories extends to works with novel-like qualities and the short story in itself still has a long way to rise in my estimation. The Bartimaeus Trilogy, Jonathan Stroud — It's very good. "Young adult" stuff. I'd dogeared some pages to quote here, but that was long ago and the desire has left me and the books are shelved. There was a mystical passage, about The Other Place, the land of the djinn and other spirit creatures, a place of a kind of oneness and nothingness of being, which was pretty mind-blowing, and I'd love to know what an 11 year old would make of it. I think Stroud knows and respects his audience: he's not afraid to use big words or complicated sentences, and he explores some very dark themes and nasty character traits. Currently reading: The Count of Monte Cristo, Alexandre Dumas. I'm not quite halfway yet, but this book? This book is awesome! It's like a thousand books rolled into one. There's even vampires! The Post Birthday World, Lionel Shriver — Found brand new for $5. I don't understand why. I'm a little scared to read this actually. I expect it'll rip my heart apart. Uncle, JP Martin — This one's Helena's, but it's still a little beyond her level of interest — it matches my level perfectly though: "the silly and skewed world of Uncle, a fabulously rich Elephant who oversees the denizens of his labyrinthine estate and fends off the attacks of his enemies, the hapless Badfort crowd." Angel Street, Patrick Hamilton — Of course. Waiting only for the perfect day, a free day, in which my brain will be unhampered and can consider it with its full attention. Just when I thought all was lost, I found a new vegetable peeler. 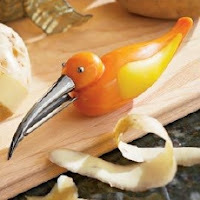 I haven't actually used it for peeling vegetables yet, but it's been put to good use the last week perching on my kitchen shelf making me smile. It's sure to work divinely — I can tell by the feel of it. Umm, I meant to write something about Helena here, but I've entirely forgotten what. Something about how much she's grown or learned. How sweet she is or strong-willed. How she's always singing. Always. I glimpsed her future self the other day. We were at the park; I gave her warning that we'd be leaving in five. And suddenly she was someone else — herself, but older maybe. Not a fuzzy outline of a person, but for a moment firmly drawn and complete. Something in her manner and her mannerisms. Something exuding from her face and her fingerips. She walked toward me, "But, mom." No argument came. A grimace of a pause in her expression. "I don't know how to explain." But I could tell she wanted to. "I don't have the words." She jumps up onto the bench, seating herself on the tabletop. Her hair falls over her eyes; her hands palms up on her knees reaching for answers. Like a college girl. She lies back on the picnic table, flinging her legs up, resting her right ankle on her left knee. She glances at me but talks to the sky. "I don't know how to explain, mama, but it just doesn't feel that it's time to go." That's not what I meant to write at all. Stories keep. Good ones, anyway. Ideas... Some ideas keep better than others. I've been keeping quiet, keeping a low profile, keeping things to myself, storing up uninteresting anecdotes. Days go by without my writing anything, and it doesn't seem to matter. Everything eventually fades into the background. I read The Keep some weeks ago, by Jennifer Egan. I really enjoyed it on the level of solid entertainment. Mine was a review copy, as it's just recently out in paperback, and the timing couldn't've been more perfect. It was a great summer read, but its quasi-Gothic feel makes it well-suited to the cool season ahead. As I mentioned previously, it hints at being deep without being demandingly deep. Sometimes I find that annoying in a book — sometimes it makes me hate a book — but this time it worked for me. Here's a meaningless comparison: it reminds me of Lev Grossman's Codex. Meaningless cuz nearly nobody's read Codex. And further meaningless cuz I can't really articulate why. The juxtaposition of gothic over thoroughly modern times. Thematically, that old question of reality; the extent to which we are the author's of our own adventures (heroes of our lives), or bit players in someone else's plot. And if it comes to that, I much preferred Codex, which was just, you know, cool. The Keep has a story (within a fortress, or keep) within a story (within a prison, or keep) within another story (whose destination is the keep). This outermost story was really weak, with a voice insufficiently different from those of the other narrators and that didn't ring true. Still, the story, as a whole, was kind of cool. A couple things stick with me. One is the guy's (the guy in the fortress story) obsession with his cellphone, his satellite, his need to be connected. Because I've felt it too. I think Egan is passing judgement (though I may be wrong), and I'm not sure I agree. We all need to feel connected, and that connection is as valid no matter by what means it takes place, technological or spiritual. The other is this word KEEP. To keep things out like a fortress. To keep things in like a jail. The thing you take care of. The thing that keeps you going. And that's the thing I've kept from The Keep — that thing. What's that thing that keeps you going? That drives you. Love? Truth and honour? My child. That thing I keep in my keep — it changes. Some days it's the secrets of my past. Some days it's my hopes for the future. I have worms in my fridge. Bedtime stories this week were plagued with difficult questions: Who's saying that? Where does it say that? Then is it the dog saying that? Why not? How do you know it's not the dog saying that? But if it's not the dog and not the boy, who's telling the story? Why can't we see him? I considered telling Helena that it's Dr Seuss who said it — he's the one telling the story. I could show her his photo again. But strictly speaking, it's not true. First, the book was authored by Theo LeSieg; while they're the same person, is it true to say they're the same writer? More pertinently, neither Seuss nor his personas is telling the story. He has written the story down, but it's told by an anonymous, omniscient 3rd-person narrator. Which is what I told Helena. Which was met with a blank stare. A Spaniard is inferior to a Frenchman in one respect: your Spaniard thinks things over, but your Frenchman thinks them up. The date of the first draft of this post is August 21, 2004 — almost 3 years ago. I meant to share with you one of my "collections," as many people were doing at the time. I year or so later I meant to resurrect that draft, to share with you, as many people were doing at the time, what's on my walls. I'm reinspired to share. My walls have changed since then. But the things on them are not so different; although, wall space being limited, some of these images are in rotation. The first Polish poster I bought was to decorate my room in residence at university. (The Dogs of War, Waldemar Swierzy.) I paid $8. It's worth considerably more than that now, though it's been sitting in my closet for about 18 years. 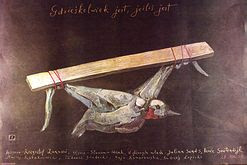 I don't exactly know what the appeal was; this particular image seemed to hold a bit of antiestablishment shock value, but beyond that I recognized in it an ineffable Polishness I wanted to connect with. American films have always been very willingly watched by the Poles not only because of their quality but also due to the role that USA played in the consciousness of an average Polish citizen living in a communist country. Many went to see American movies to become acquainted with the country that was meant to counteract, both culturally and politically, the Soviet Union. These were the times when only few people were allowed to travel, so western films and American in particular, showed different patterns of social and cultural behaviour. They influenced fashion, the choice of music and provided an instant trip to a different world. The attitudes caused by American films raised the concern of the communist establishment, to such an extend, that for almost ten years/1949-1957/American movies disappeared from Polish screens. In the late fifties/the era of political metamorphosis set off by Stalin's death/American films were back, this time to stay for good. We have a great pleasure in presenting these posters to you. They were made in the period 1947-1992 and they are a part of "The Art of Poster's" collection consisting of over five hundred American films' titles from the period 1947-1999. A lot of patronizing drivel had been written about the 'Polish School' of poster design being a 'product' of a 'resistance to Communism' or some such (and by extension, of an overwhelming desire to breathe free under the learned guidance of a Bushmonkey-on-a-cheney). That view, espoused by Western writers who don't know any better, and Polish ones (who should know better) has been omnipresent lately. 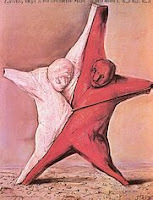 No matter that the idea of art as an expression of political circumstance is par excellence a classic communist one. In fact, quite the opposite seems to be true : free from commercial stranglehold, these artists produced brilliant works over an extended period of time. A lot of talented people found themselves in the right place at the right time. Like any artistic movement (or 'school'), it had its own dynamics, peaks and valleys. Indeed, some of the most accomplished works were political (pro-socialist). 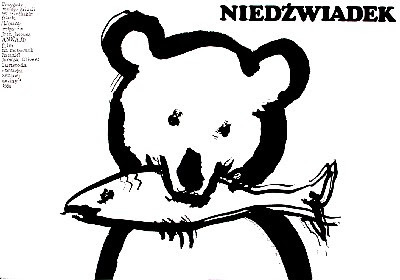 And now the fact that Polish film poster is dead (and had been so since 1989 when the film distribution was privatized) is further evidence of that. "Thank you, and be happy for the rest of your life." Lunchtime: Lebanese food, which I love as much for the gallant service, the blessings liberally yet judiciously bestowed, as for the tang. It makes me smile. Also found: John Brunner's Stand on Zanzibar. Which made me jump up and down and squeal with glee. I've been looking for it since Christmas, for J-F, though I'm curious about it myself. Sure, I could've ordered a copy — a discard that fell into some weirdo's bathtub — online from an anonymous bookseller, but that would've denied me the thrill of the hunt and of today's ultimate discovery. I meant to share this find with the world and plead that you not tell J-F, as I'd intended to save the book for an appropriate gift-giving occasion, but when I came home this evening, he asked if I've given thought to what reading material I'd be bringing to the cottage this weekend (I have, but inconclusively) and he mentioned having to dig something up for himself to read, I presented it to him then and there. We're off to his Mom's cottage this weekend. I'm considering bringing Infinite Jest again, but am afraid that doing so would only be reinforcing both the novel and the cottage with negative associations. I'm still reading the same 2 books I was reading at this time last week. A week ago I was somewhat awed by the fact that I was reading 3 books at the same time, and it made me feel readerly and productive. But I've since finished only 1 of them, and my progress through the others feels negligible; it's discouraging. I look forward to returning to my usual one-book-at-a-time ways. We had a storm earlier this week. Thunder cracked just as Helena and I were leaving the house to catch the metro. And then the rain fell. We two, we were stopped in our tracks, still under cover of our building's entranceway. Helena said she was scared. I'm not certain she was genuinely scared or just trying "scared" on for size, but either way I felt moving forward risked traumatizing the child, so we went back inside. We waited. And waited. I called into work that I'd be late. We waited some more. The rain didn't let up, but the thunder and lightning seemed to have moved on. We went forth with our trusty umbrellas, singing. Yesterday, I wore new shoes. Black square-toed, fat-heeled Hush Puppies on sale for $30 — the kind of sensible shoe I'd been looking for. It turns out they're much higher than I'm used to; or at least, the rise is steeper. I spent the morning walking slowly, trying not to walk at all if I could help it, to keep the left shoe from falling off. By late afternoon, I was wondering how they could be pried off. Today, my feet hurt. I find myself wanting to be the kind of woman who wears a certain type of shoe. I just haven't decided on the shoe. I still lust after, and occasionally visit, the $785 Roberto del Carlo shoes in the shop around the corner from my office. I bet they're very comfortable. It's from The Hollow Men, by TS Eliot. I've studied Eliot more than any other poet, but not this poem in particular. I'll be reading it more carefully in days to come. It seems, these days, I'm encountering the Shadow every way I turn. Coming this weekend to a park near me: Molière's Scapin! the Schemer, presented by Repercussion Theatre.